This is my fifth Christmas in a row in Santander. As you’d expect, ‘Navidad’ is very different here in Spain and nowhere is that more evident than at the dinner table. Fish and fishing are an important part of Cantabrian life and for the next two weeks (Christmas lasts right up until January 6 when the Kings bring the presents) I’ll be consuming quite a lot of fish. 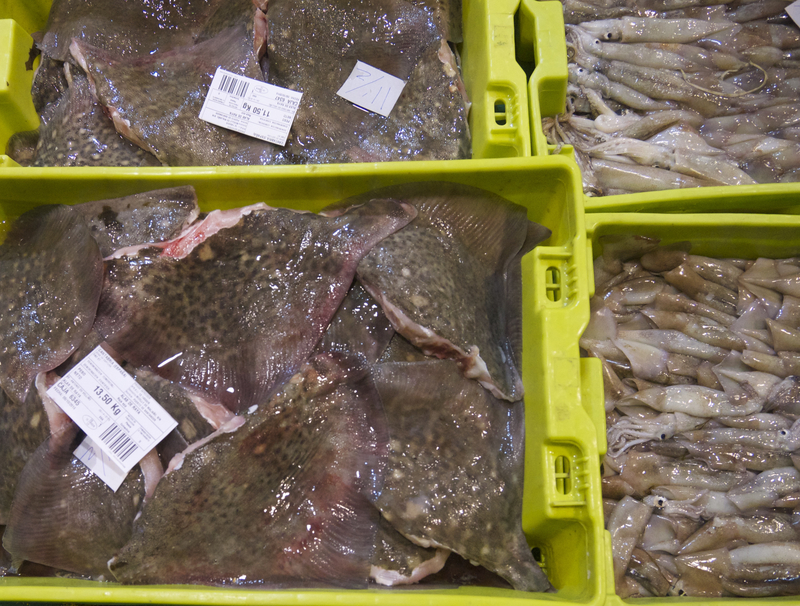 Fish is everywhere – in the markets, in the shops, on the bar and restaurant menus and of course, in the home. People here go fishing, they talk about fish, they think about fish and they eat a lot of fish. I’ve seen stats suggesting that Spaniards eat their weight in fish each year. 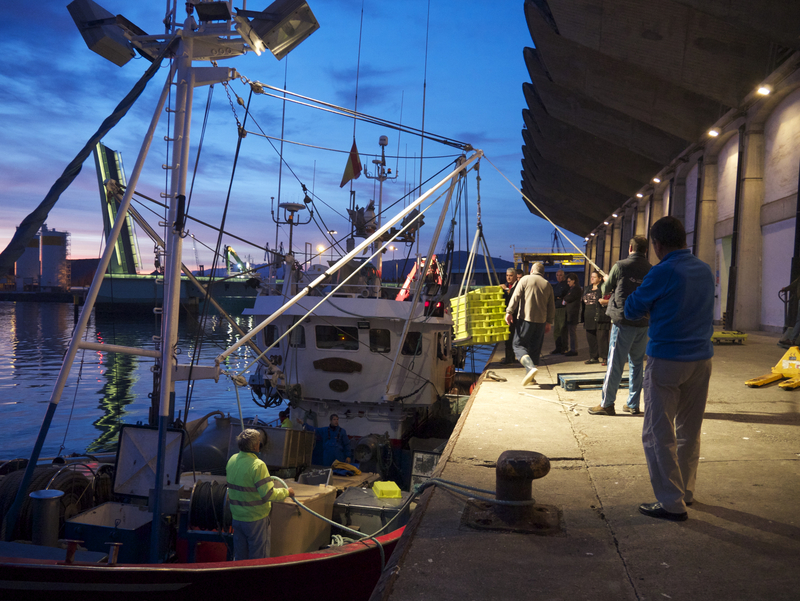 It’s hard to establish exactly what is eaten outside the home, but the average Cantabrian consumes a whopping 33 kilos of fish in their home in a year which is 24 percent more than the national average. 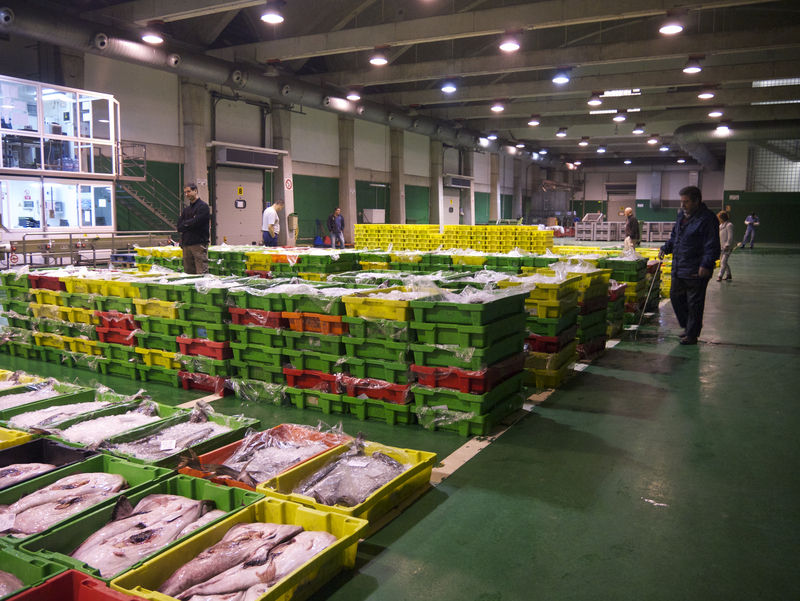 Given the importance of fish in this part of the world – one of the most interesting visits I’ve had this year was to the wholesale fish market in Santander called the ‘lonja’. I’ve fantasised about seeing this place since I moved here. You see, everywhere you purchase or consume fish in the city says that its produce is sourced at this mythical ‘lonja’. I hoped somehow or other this blog would take me there and thanks to a rather foodie-focused second half to 2014, I was in! As we walked into the main building, we were spotted straight away and Marta was greeted with a dry-humoured request for ‘pasaportes’ by some of the guys there. She explained to us that she usually brings in somebody from the ‘outside’ once a year. I can’t bet on it but I reckon we probably stood out a bit more than her last group! Inside, our eyes took some readjusting to the bright lights and there, it was, in every shape, size and colour – fish! 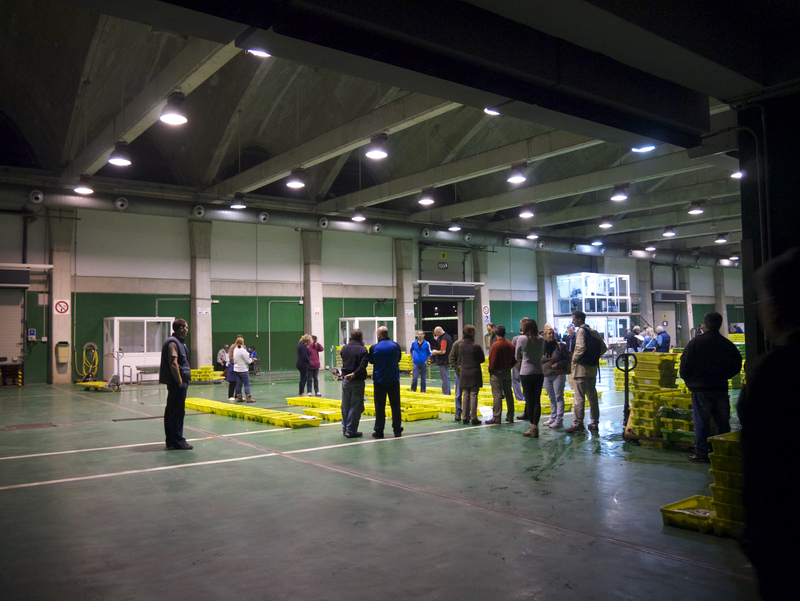 I was in my element walking around the lines of crates that had been taken off the boats that very night. As you’d expect with so much fish, there’s a lot of ice and water and before we stepped out of the car Marta told us to be careful with the slippy floor. She was right too – it was like an ice-rink. I gripped my camera extra firmly – didn’t want that taking a bashing, whatever about myself! Looking around, I could see the buyers were doing pretty much what we were doing – checking out the crates to decide what looked good. I was surprised by the difference in each crate’s content and presentation. 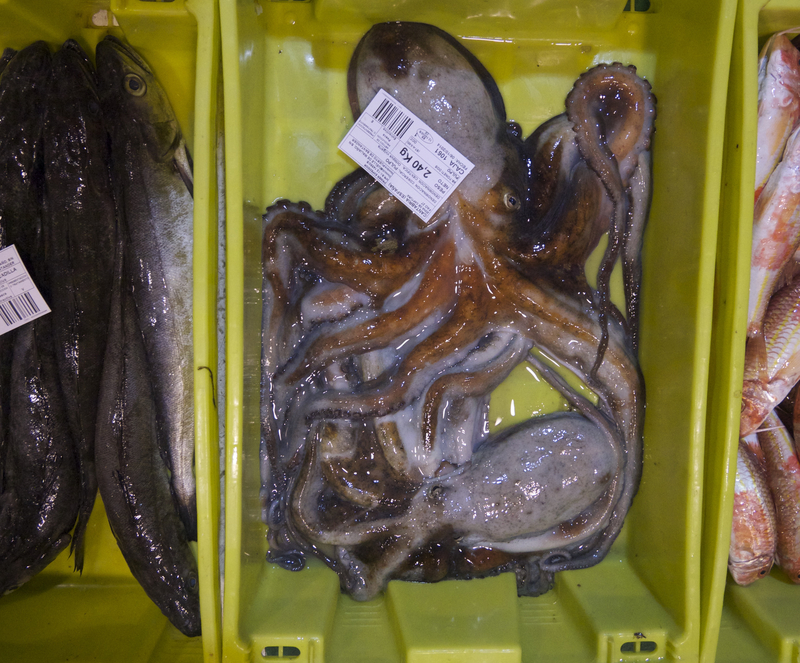 Most crates were filled with just one species of fish – although I did spy a handful of ‘lucky dips’. And most were beautifully displayed. 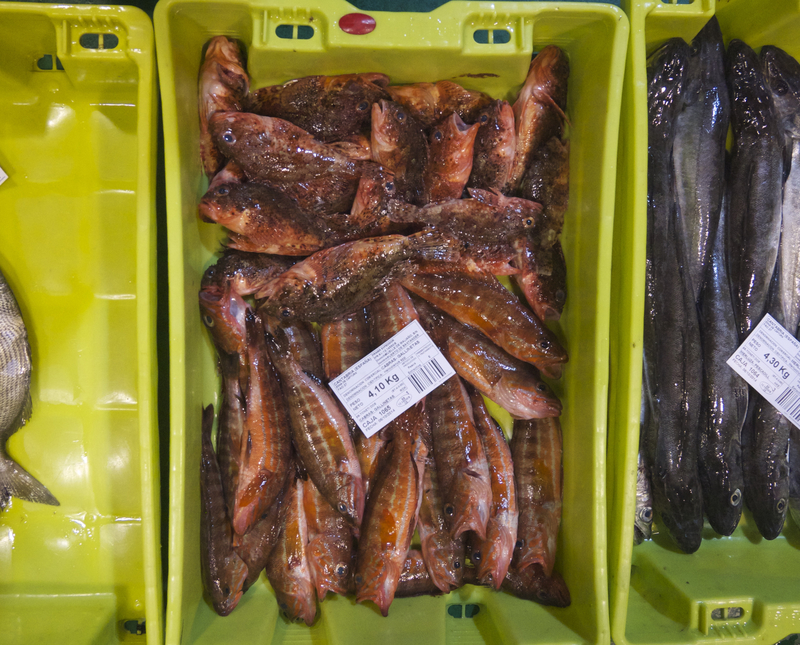 A few of the crates contained a single large fish – we learned that these bigger items tend to be bought by restaurants rather than the market traders or buyers for the supermarkets. Wrapped around each other – you’d need an industrial-sized oven if you’re going to serve these guys intact! Everybody had been friendly outside but in here it was business. Before we walked in, Marta mentioned that she felt very self-conscious when she went in with strangers – and I knew what she meant when we opened the door. 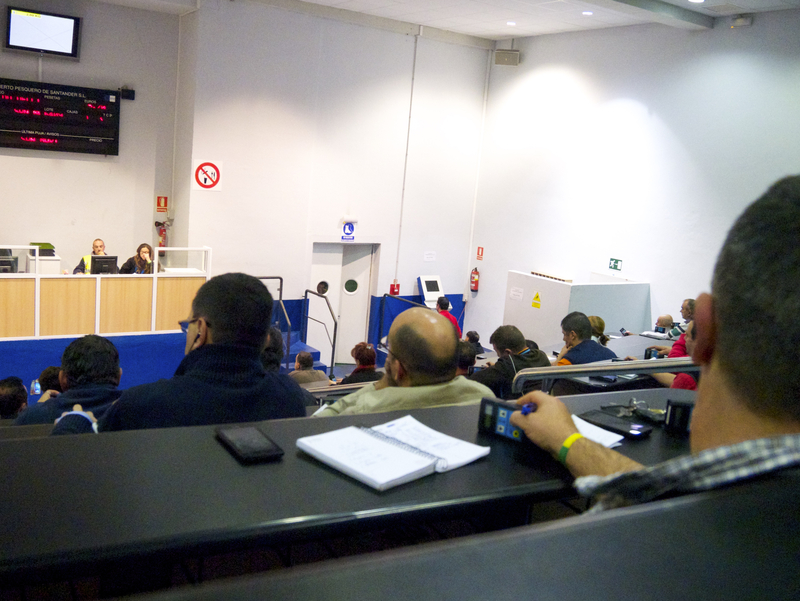 The room is set up like a lecture theatre – with raised benches and desks – a real walk of shame! First you have to pass the auctioneer and then as you climb up the steps you go past all the buyers. There’s no slipping in and out – you’re there for everybody to see. We crept in and went up to the back (behind Marta’s husband Enchi) as discretely as possible. You could hear a pin drop the place was so quiet. This auction operates Dutch style with the price starting high and falling until a bid is made and the item is sold. In the photo below you can see the white screen which shows the images of the fish crates going under auction, the black and red screen below shows the price (as it’s falling) and the name of the successful bidder when a bid or multiple bids are made. The guy in the high-vis jacket is the auctioneer who seeks a nod or some verbal confirmation of each bid from the successful bidder. There’s an element of tension in the room and a sense of competition amongst the buyers but the auctioneer is very relaxed or at least he appears to be with his steady voice and calm manner. 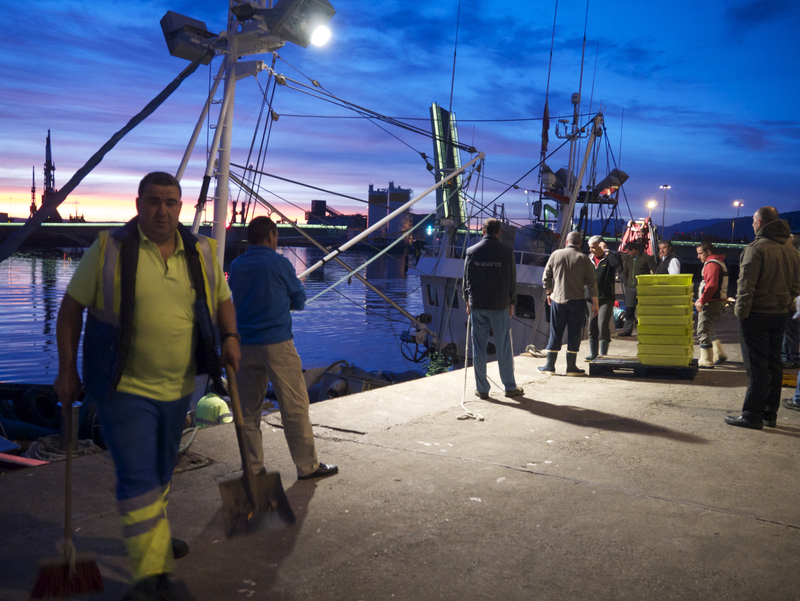 Alongside the auctioneer is the ‘niño’ – the boat’s rep who does the running and fetching on shore. Today that’s usually done by one of the crew’s wives or children. The ‘niño’ comes into the auction to observe the proceedings and to turn down a bid when it goes below whatever s/he felt was the reserve for that day. That morning we saw quite a few crates being removed from the sale by their ‘niño’. Marta said that those items might be offered instead to restaurants directly. And what about the buyers, you ask? I’ve a soft spot for this profession since my time in Dell Computers. They were the rock ‘n roll stars of the entire operation and I was curious to see whether this was replicated here. I recognised quite a few faces from the market – including Jesus the President of the Traders Association. I was told there were quite a few buyers from the supermarkets – and while I was there I saw successful bids highlighted on screen by BM, Lupa and Supercor. I was surprised to learn that one of the buyers works directly for a restaurant – which is a new development here and not necessarily a popular one with the rest of the registered buyers as far as I could make out. I got talking to one of the supermarket buyers and he told me that technology was making his life a lot easier. Before he often found himself buying in response to a promotion set at HQ weeks earlier but today his supermarket is responding to his purchasing decisions practically in real-time. As we left the first round of auctions, we heard one of the smaller fishing vessels – a ‘bajura’ had just docked. Marta told us that priority is given to the smaller craft in the market – and when they arrive, all focus is on them and their catch. We went outside and it was beautiful to see the boat coming in and being unloaded. After all the auctions were over, the dockets issued and the bills paid, it was time for the bigger buyers to have their deliveries loaded up and the smaller buyers to load up their own crates into their vans. The dry side of the lonja was packed with white vans of every size and shape being loaded. We watched Marta’s Enchi wheel off their purchases – including a few crates of mackerel we’d seen Marta buy. My partners in crime, Conor, Marta and Domingo. And yes, they have a fish in their hands – one of Marta’s purchases! And that was it. We left the market. It was only when we left that we got to see the outside of the building properly – it had been too dark when we arrived. The 5,769 square metres space (115 metres long x 30 metres wide) is an interesting structure designed by Juan Jose Arenas in 2003. If his name is familiar to you, perhaps you read my Llamas Park blogpost from this time last year. Anyway, these 20-odd flying buttresses which you can see in the image below (each measuring 7.5 metres) support the weight of the building – meaning the inside could be a wide-open space, free of columns which is exactly what you need in a market. If you’d like to know more about the design, you should see these images from the engineering firm which showcase the design brilliantly. Whatever happened to the Old Lonja? 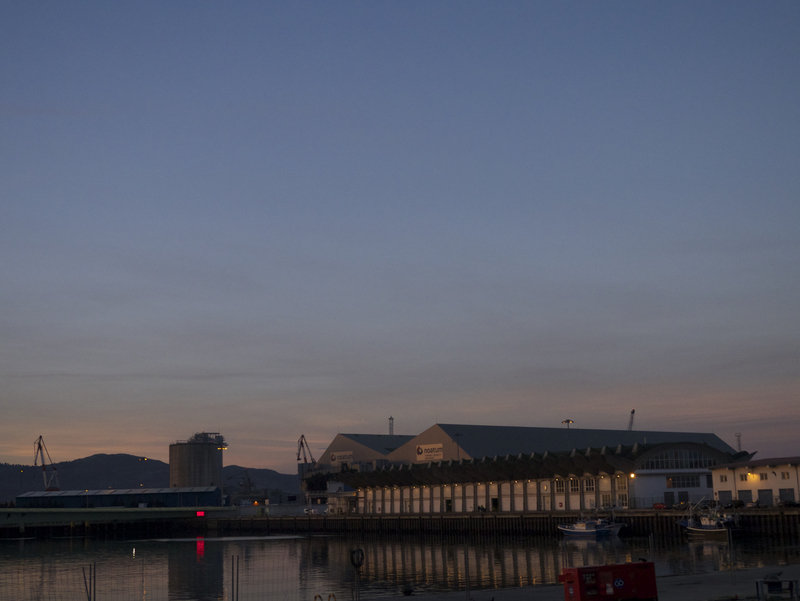 As you’d expect in a coastal city such as Santander, this new fishmarket isn’t the city’s first. Aníbal González Riancho’s creation from 1943 was demolished in 2006 – you can see an image of the ‘rationalista’ building one week before it was knocked here. 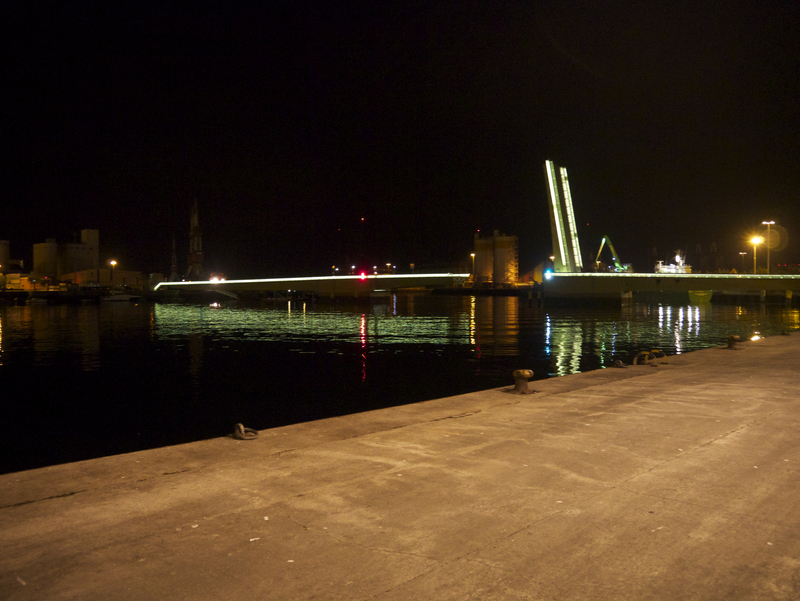 Since then, the space has been used as a carpark but in a few weeks time, a new waterfront walkway and a playground will be opened. The mayor’s office expects the new cycle lane will be opened even sooner – perhaps this week. I knew the demolition of the old ‘lonja’ didn’t go down very well with the city’s architects. And many others including historian Jose Luis Casado Soto and parish priest for the area, Alberto Pico Bollada (two of the city’s great personalities who sadly passed away this year) had also campaigned for the building to be saved. There were no shortage of ideas for the space including a community theatre and a flower market. A number of architects put forward proposals which you can see here. It’s a real shame that a city so dependent on tourism didn’t save the old gem but it’s much too late for regrets now. 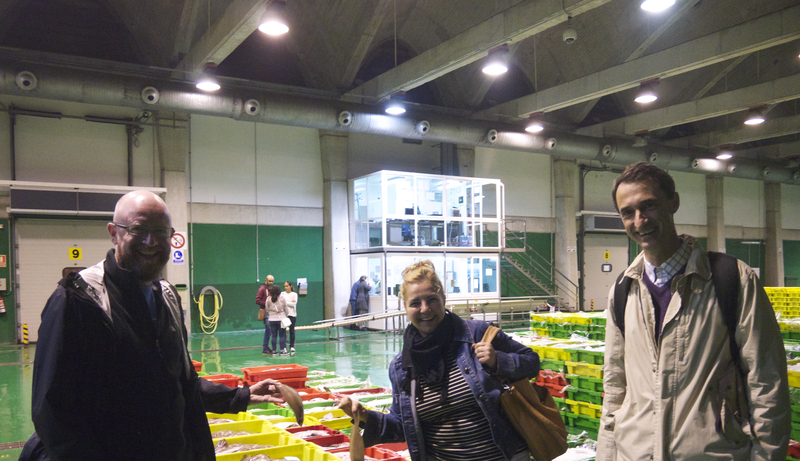 History aside – the visit to the fishmarket was a real treat. Afterwards we went for a coffee at Enchi’s sister’s bar close to the site of the old ‘lonja’. I’m sure these walls have heard everything there is to hear about fish and much more. The hot coffee went down a treat after our early and chilly start. Marta was a real star and dropped us back into town before starting her day at the Mercado de la Esperanza market behind the Town Hall. Not many of the fish stalls open on Mondays but Marta goes in. Whatever she sells goes towards paying off a bill, she says, and she’s ahead of the game for the rest of the week. 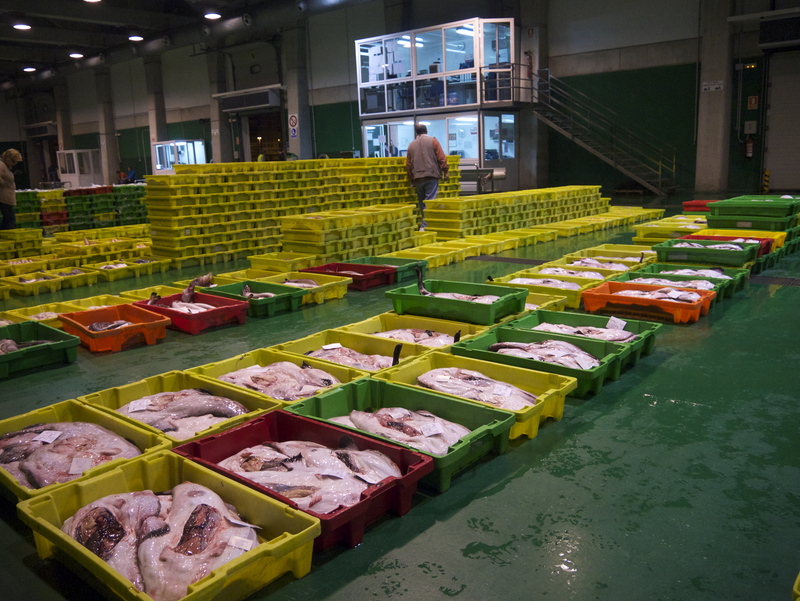 So there you have it – Santander’s wholesale fishmarket! Have you been inside? Would you like to see inside one of these spaces? Some ‘lonjas’ are open to the general public. Do you think Santander would benefit by opening its doors? WOW! That was very interesting!!! Thanks Sonia – have a lovely Christmas yourself! Fascinating look behind the scenes, thanks Pamela! Your photos have such a lovely atmosphere about them. Hope you had a very happy Christmas and all good wishes for an exciting 2015! My wife and I have just moved to Santander, leaving the Australian summer for the cold rain/hail/snow of Santander. Nonetheless, we already love it for many of the reasons you speak about in this blog. I have loved reading about the Mercado, which has at times daunted me. Not only for the language barrier, which I am working on; but also, because of the differences of ingredients. I am wondering if you know of any good resources that could be used as a foray into Cantabrian cooking? You mentioned the stall owners having recipes, do they usually offer them or do you ask? Either way, I do hope to meet you in the year that we are here possibly even run into at the market! Nice to have you pop by my blog. 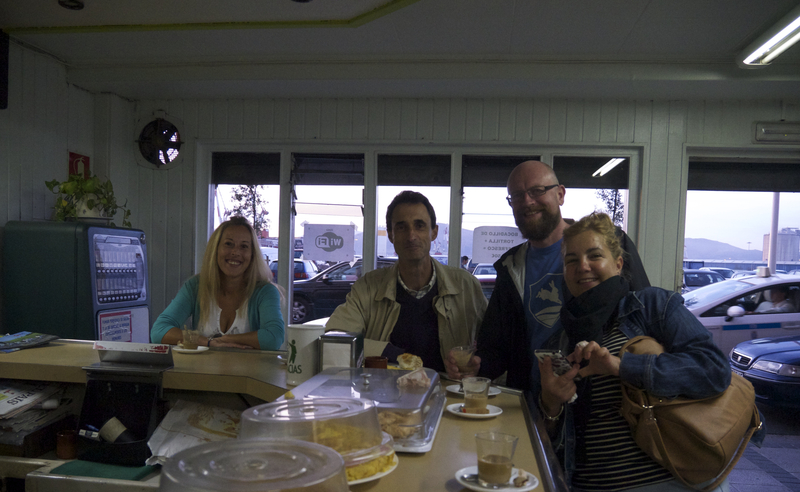 The best way to learn about Cantabrian food is to eat it – but I had it easy via my in-laws. If you are hoping to learn Spanish and pick up a few recipes, I would start asking for an intercambio (language exchange) online or put a message on a noticeboard locally and mention that you’d like a foodie element to it. I did this in Madrid when I lived there – I wanted to learn about the city so I did an intercambio with a woman who knew the city well and we walked around a different neighbourhood each week – swapping from Spanish into English from time to time. Maybe suggest an intercambio at one of the tapas bars and use the time to discuss the ingredients and ask how certain dishes are made. Other than that you’ll find a few recipes online – the heavier bean and chickpea stews known as cocidos take a bit of getting used to. I’d start with a fish stew (sopa de pescado) at home and when you are out, try some of the local seafood platters such as rabas and mussels. When you at feeling adventurous go for the necora crabs (they take a while to eat but are delicious). As regards recipes at the market, I always ask when I see a fish how it should be cooked. Let me know how you get on. I’m sure our paths will cross – delighted to hear you are getting stuck in. I really enjoyed reading this! I love your writing style and really appreciate the extra information about the architects, restaurants, customs and statistics. Spanish food is amazing, I always bring back a big bag of dried garbanzos and some pimenton ahumado to make myself a bean stew at home. As a veggie it can be hard to eat in Cantabria. 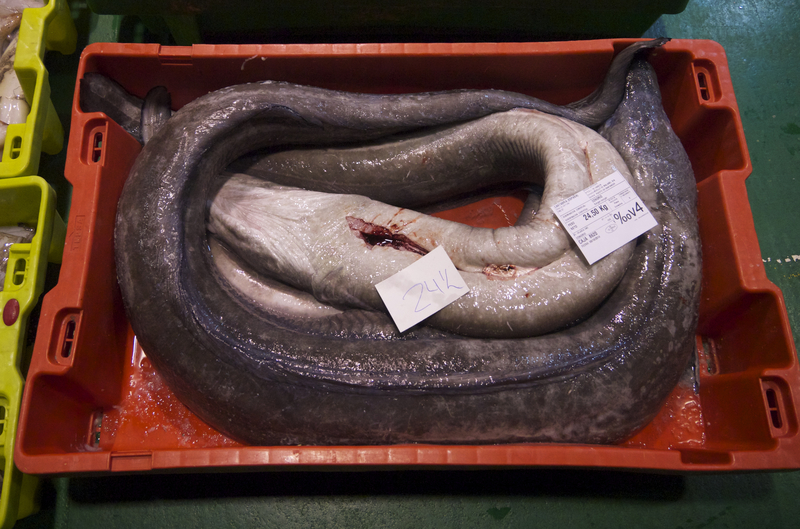 Even though I don’t eat fish, the markets absolutely fascinate me. You’re so lucky to have got the chance to go to a wholesale auction! 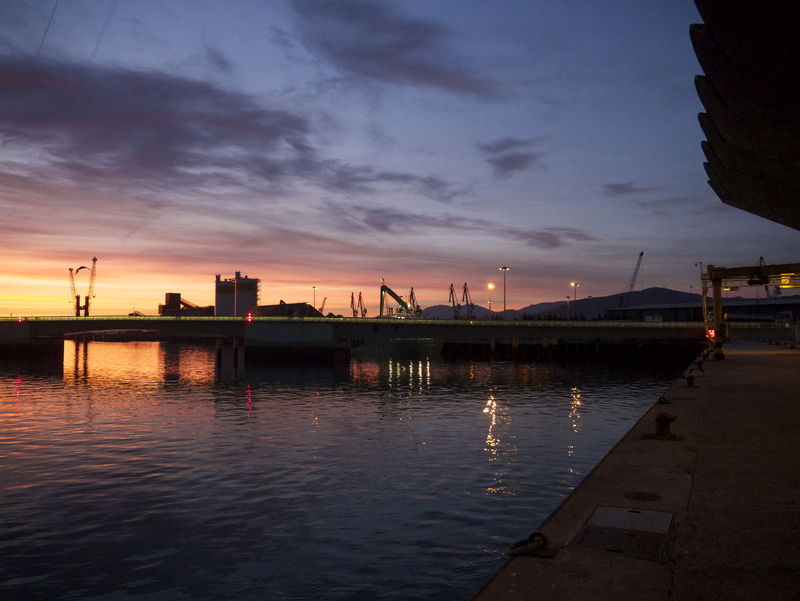 I read your article with interest and nostalgia for Santander. I spent 4 months there back in 1993 while on my year abroad from university and went to a place where the fishing boats come in to eat fish. Problem is, I can’t remember what it is called. There were loads of restaurants serving up the catch of the day. I’d love to go again during my visit to Santander next year and would be most grateful if you could shed any light on the subject. Thanks loads for your help.. Apologies for not replying earlier and great to hear you are returning to Santander. I hope you like what you find. 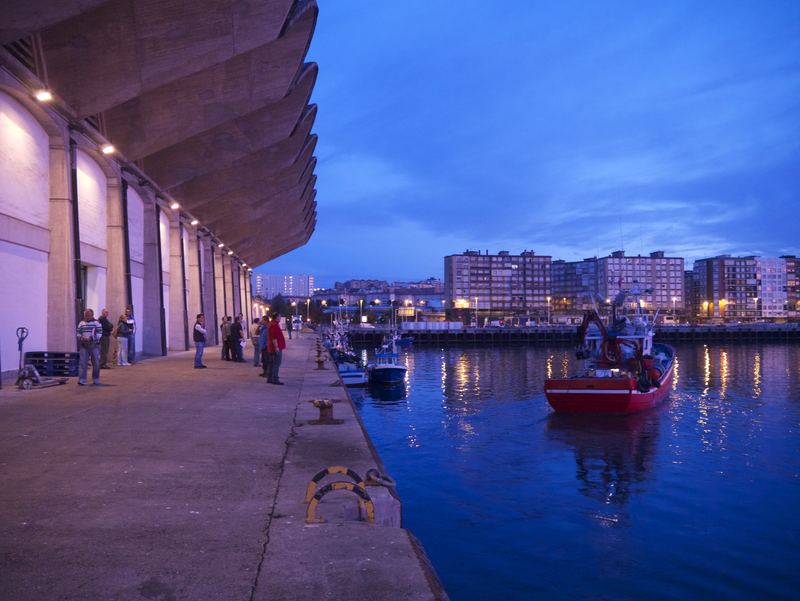 You asked about a fish restaurant where the boats come in – well, there are a few there, including one called El Muelle which is on Avenida Sotileza 36, inside the Barrio Pesquero (where the fishing boats come in today). You might also have been on Calle Tetuan, a street well-known for its seafood restaurants. It’s changed a lot since you were here but many of the restaurants are the same – perhaps it was ‘Flor de Tetuan’, ‘La Mulata’, ‘El Marucho’, ‘Casa Silvio’ or ‘Puerta 23’ – and you’ll find a few new places to try there as well. I’d recommend you start in Calle Tetuan which is very central and if that doesn’t look at all familiar then go to the Barrio Pesquero – it’s quite a long walk from the centre so get a cab over.